Sometimes, I just want a piece of chocolate. Don’t we all? But sometimes I don’t have any laying around and I also don’t feel like going out just for a piece of chocolate. We can all relate, right? Well, my raw vegan coconut oil chocolate is the solution. It’s super duper easy to make with just 4 ingredients, melted coconut oil, maple syrup, raw cacao powder, and salt. All you have to do is mix it all together and freeze! That’s it! 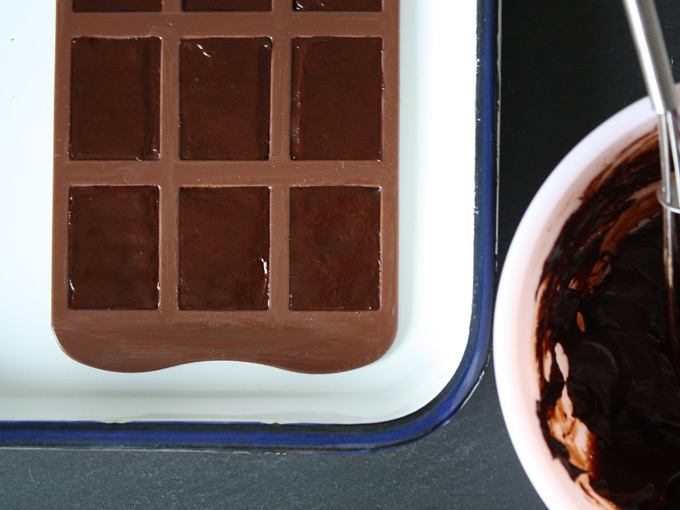 And because it’s coconut oil based, there’s no tedious chocolate tempering involved. Since coconut oil melts at 76℉, it won’t travel very well so keep it in the freezer for those sudden chocolate cravings attacks you get at home. 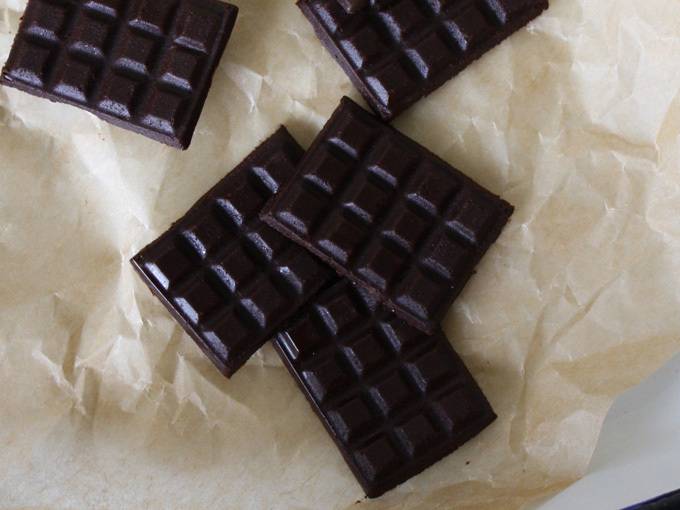 A delicious raw chocolate will always be waiting for you in your freezer at all times. How awesome! Now let’s whip these babies up, shall we? First things first, melt the coconut oil in a luke warm water double boiler. Add all of the ingredients into a bowl and whisk well until you have a nice thick smooth chocolate sauce. Fill a silicone chocolate mold with the chocolate sauce and place it in the freezer for about 30 minutes until the chocolate hardens. If you don’t have a silicone chocolate mold, spread the chocolate sauce onto a parchment paper into your desired thickness and freeze. Once the chocolate is firm, take them out the mold and store them in a freezer-safe airtight container and keep it frozen. If you spread the chocolate on a parchment paper, break the chocolate sheet into bite-sized pieces and store them in an freezer-safe airtight container and put it back in the freezer. 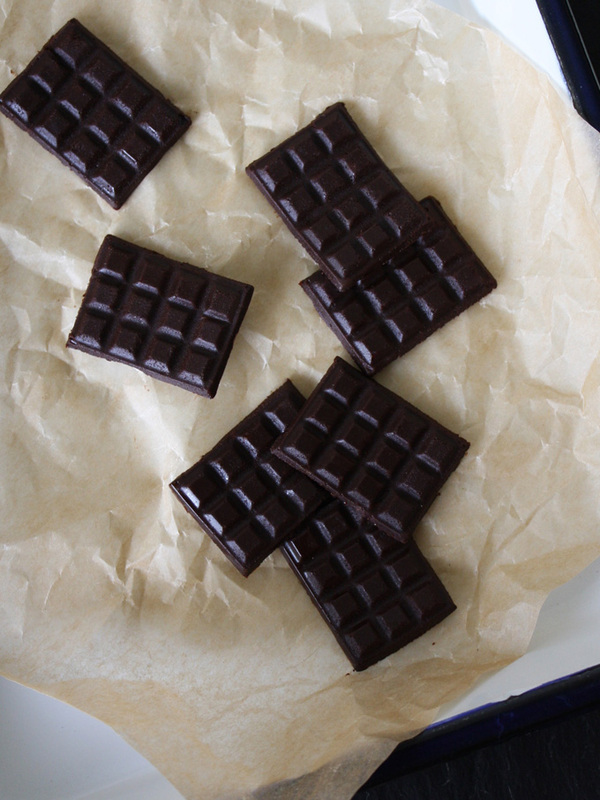 Now these quick and easy raw chocolates are ready for you to eat at any time! Woohooo! 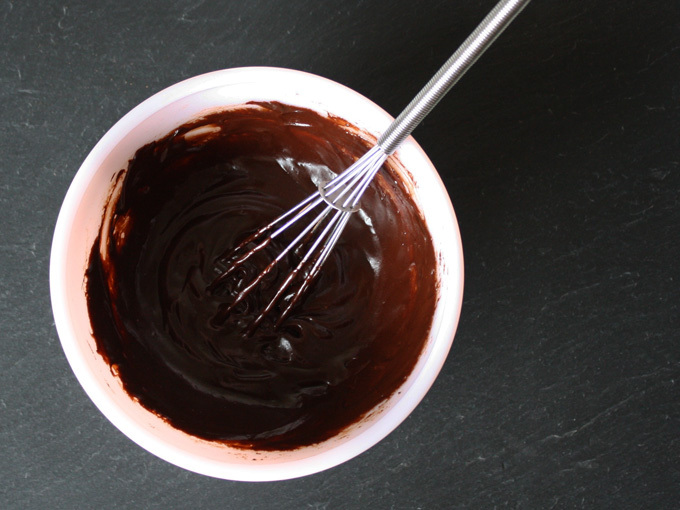 Add all of the ingredients into a bowl and whisk well until you have a nice thick smooth chocolate sauce. Fill a silicone chocolate mold with the chocolate sauce and place it in the freezer for about 30 minutes until the chocolate hardens. If you don't have a silicone chocolate mold, spread the chocolate sauce onto a parchment paper into your desired thickness and freeze. Once the chocolate is firm, take them out the mold and store them in a freezer-safe airtight container and keep it frozen. If you spread the chocolate on a parchment paper, break the chocolate sheet into bite-sized pieces and store them in an freezer-safe airtight container and put it back in the freezer. Since coconut oil melts at 76℉, these coconut oil chocolate won't travel very well so keep it stored in the freezer. Keeps for 1 month in the freezer.